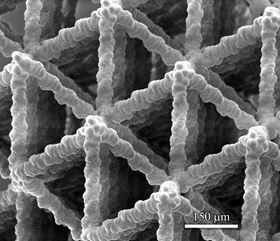 This image shows one of the microstructures developed at Washington State University, which could find use in batteries, lightweight ultrastrong materials, catalytic converters, supercapacitors and biological scaffolds. Image: Washington State University. Researchers at Washington State University (WSU) have developed a unique, 3D manufacturing method that for the first time can rapidly create and precisely control a material's architecture from the nano- to centimeter-scale. The results closely mimic the intricate architecture of natural materials like wood and bone. The researchers report their work, which could have many high-tech engineering applications, in Science Advances and have filed for a patent. "This is a groundbreaking advance in the 3D architecturing of materials at nano- to macroscales with applications in batteries, lightweight ultrastrong materials, catalytic converters, supercapacitors and biological scaffolds," said Rahul Panat, associate professor in the School of Mechanical and Materials Engineering, who led the research. "This technique can fill a lot of critical gaps for the realization of these technologies." The novel 3D printing method creates fog-like microdroplets containing nanoparticles of silver and deposits them at specific locations. As the liquid in the fog evaporates, the nanoparticles remain, creating delicate structures. These tiny structures, which look similar to Tinkertoy constructions, are porous, have an extremely large surface area and are very strong. Silver was used because it is easy to work with. However, Panat said that the method could be extended to any other material that can be crushed into nanoparticles – and almost all materials can be. The researchers created several intricate and beautiful structures, including spirals, microscaffolds that contain solid truss members like a bridge, and electronic connections that resemble accordion bellows or doughnut-shaped pillars. The manufacturing method itself is similar to a rare, natural process in which tiny fog droplets that contain sulfur evaporate over the hot western African deserts to give rise to crystalline, flower-like structures called ‘desert roses’. Because it uses 3D printing technology, the new method is highly efficient, creates minimal waste and allows for fast and large-scale manufacturing. The researchers are looking to develop such nanoscale and porous metal structures for a number of industrial applications; for instance, they are developing finely detailed, porous anodes and cathodes for batteries. This advance could transform the industry by significantly increasing battery speed and capacity, and allowing the use of new and higher energy materials. Divergent 3D has entered into a strategic development partnership with SLM Solutions Group.